Will not rust, dent, chip or peel. Handles both industrial or commercial loads. Leakproof top features rounded corners to protect walls, furniture, and equipment. Top shelf will accommodate hook-on utility basket (sold separately). 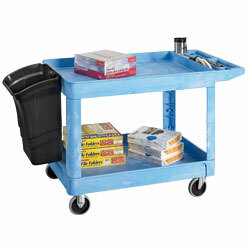 Lightweight carts are easy to maneuver on 2 fixed and 2 swivel non-marking casters. Optional lockable center drawer is perfect for extra tools and paperwork. SPECIFY COLOR: BE - Beige, BL - Blue, BK - Black, GY - Gray. Colors are available as listed by code in chart. IN STOCK. XT-1019BE 5" rubber	 31	 BE, BK, BL, GY	 Beige	 500	 2	 18-7/8"	 30" x 16"	 33-1/4"
XT-1019BK 5" rubber	 31	 BE, BK, BL, GY	 Black	 500	 2	 18-7/8"	 30" x 16"	 33-1/4"
XT-1019BL 5" rubber	 31	 BE, BK, BL, GY	 Blue	 500	 2	 18-7/8"	 30" x 16"	 33-1/4"
XT-1019GY 5" rubber	 31	 BE, BK, BL, GY	 Gray	 500	 2	 18-7/8"	 30" x 16"	 33-1/4"
XT-1060BE 5" rubber	 38	 BE, BK	 Beige	 500	 3	 7-3/4"	 30" x 16"	 33-1/4"
XT-1060BK 5" rubber	 38	 BE, BK	 Black	 500	 3	 7-3/4"	 30" x 16"	 33-1/4"
XT-1021BE 5" rubber	 45	 BE, BK, BL, GY	 Beige	 500	 2	 18-7/8"	 36" x 24"	 33-1/4"
XT-1021BK 5" rubber	 45	 BE, BK, BL, GY	 Black	 500	 2	 18-7/8"	 36" x 24"	 33-1/4"
XT-1021BL 5" rubber	 45	 BE, BK, BL, GY	 Blue	 500	 2	 18-7/8"	 36" x 24"	 33-1/4"
XT-1021GY 5" rubber	 45	 BE, BK, BL, GY	 Gray	 500	 2	 18-7/8"	 36" x 24"	 33-1/4"
XT-1061BE 5" rubber	 56	 BE, BK	 Beige	 500	 3	 7-3/4"	 36" x 24"	 33-1/4"
XT-1061BK 5" rubber	 56	 BE, BK	 Black	 500	 3	 7-3/4"	 36" x 24"	 33-1/4"
XT-1023BE 8" pneumatic	 66	 BE, BK, GY	 Beige	 500	 2	 18-7/8"	 36" x 24"	 33-1/4"
XT-1023BK 8" pneumatic	 66	 BE, BK, GY	 Black	 500	 2	 18-7/8"	 36" x 24"	 33-1/4"
XT-1023GY 8" pneumatic	 66	 BE, BK, GY	 Gray	 500	 2	 18-7/8"	 36" x 24"	 33-1/4"
XT-1024BE 5" rubber	 52	 BE, BK	 Beige	 750	 2	 18-7/8"	 46" x 24"	 33-1/4"
XT-1024BK 5" rubber	 52	 BE, BK	 Black	 750	 2	 18-7/8"	 46" x 24"	 33-1/4"
XT-1025BE 8" pneumatic	 74	 BE, BK	 Beige	 750	 2	 18-7/8"	 46" x 24"	 33-1/4"
XT-1025BK 8" pneumatic	 74	 BE, BK	 Black	 750	 2	 18-7/8"	 46" x 24"	 33-1/4"
XT-1080 25" x 17"	 For 30" x 16" cart. Wt. 12 lbs. 40-lb. cap. XT-1081 25" x 17"	 For 36" x 24" and 46" x 24" carts. Wt. 12 lbs. 40-lb. cap. XT-1082 17"W x 12-1/8"D x 10-1/2"H.	 4-Gal. Cap. Wt. 5.4 lbs. XT-1083 17"W x 12"D x 22"H.	 8-Gal. Cap. Wt. 9 lbs.